Summer squash will freeze, but the vegetable turns mushy and is really only appropriate to hide within tomato sauces and soups afterward. Since our glut of summer squash is already beginning, I decided to see if they would dry any better. If you want to make squash chips, sprinkle some salt on your blanched squash. I've been told that squash chips make a healthy and delicious snack, which I can believe from nibbling on an unsalted chip, but we opted to dry without salting so that the squash would be appropriate for winter main dishes. Then dehydrate your squash at 125 degrees Fahrenheit for up to 12 hours. I wasn't very careful to cut my slices all the same thickness, so I took out about half the squash after 5 hours, another quarter at 6 hours, and the final set at 7 hours. Your squash is dry if it's crispy in consistency with no damp pockets that give between your fingers. You'll soon be able to tell whether squash is dry at a brief touch. We'll store our dried veggies in the freezer while there's space, then move them to the fridge in late summer when iced accommodations get scarce. I figure one cup of dried squash is equivalent to maybe 4 cups of frozen squash, so even if we kept the squash in the freezer full time, we'd be ahead of the game. We tested our dried crooknecks in a soup and decided that the flavor was much better dried than frozen, nearly as good as fresh. A definite success, and our new method of saving summer squash for the cold months. thanks for this, I'm up to my ears in summer squash right now, I've been considering canning it but will give this a try! Will you share your reciepe for soup with dried summer squash? Sounds great! Thanks! It never occurred to me to freeze squash before, what a great idea. So will it spoil if kept just bagged? It has to be in the fridge or freezer? Do you know how long it will store? Sarah --- It's not really a "recipe", so much as throwing together whatever I have on hand. 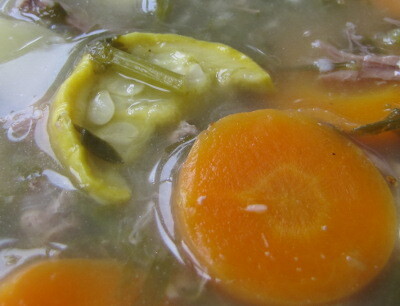 My July ebook actually tells a lot about my soup philosophy, and so does my post about harvest catch-all soup. This particular soup was okay, but not great, and consisted of a base of homemade chicken stock simmered for a few hours with as many potato onions as I could trick myself into cleaning (about a handful), most of a head of garlic, a big handful of parsley, and the last chunk of 1.5 year old venison out of the freezer. About forty-five minutes before eating, I tossed in four big carrots, about an equal volume of potatoes, and some salt and pepper. Then, fifteen minutes before eating, I threw in some green beans, amaranth, and the summer squash, turned off the heat, and left the lid on to allow the last ingredients to cook while the soup cooled to eating temperature. The soup was only okay because I didn't put in enough onions, so it wasn't as sweet as I like it, and since I added a bit too much water and stretched the chicken stock too far. Live and learn! 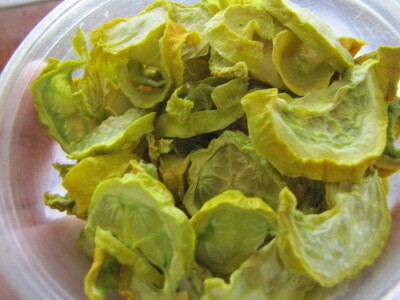 Homemade --- Dried vegetables don't usually spoil so much as slowly lose nutrients and flavor. You can keep them on a shelf in a dark spot for up to a year if you play all of your cards right, but the odds are stacked against that kind of storage for us because of our humid environment and because I choose not to use sulfur or any of the other preservatives. Luckily, dried vegetables don't go bad in any way that will hurt you, so you can experiment with the best way to store them in your house without any fear of botulism or other scares. Just smell or taste one before using them, and if it's moldy or lacks flavor, toss it out and store a different way next year. I have not dried squash in years so I looked online to be sure I remembered how to do it. I didn't salt mine in the past either; this time I plan to do it both ways so we'll have some for snacks and some for cooking. I don't like frozen squash--too mushy. Pickled is good but we can only eat so many and the plants are giving bounteous amounts this year. Thanks for the good information--and the reminder to blanch first! I'd forgotten that step. Definitely do blanch --- it makes a big difference in quality.